Very knowledgeable staff and competent workers. Steve and his team were very easy to work with and gave great recommendations. Steve helped me come up with the design plan and recommended various sources for the fixtures and tile. The work was down to perfection and the job ended within budget and also on time. The AHSI foreman on site, Miguel, was also easy to work with and extremely responsive to my questions. I highly recommend AHSI and plan to use them when I redo my roof and my guest bathroom. Steve came out and replaced some siding that was damaged when some trees hit the side of my town home. Steve matched the siding and installed it. I cannot tell where the hole was because Steve did a great job of replacing the siding. Steve from Absolute did a very thorough estimate. Unlike some of the other roofers I contacted, he actually got up on the roof and took a closer look at the issues. As far as the work goes, they did everything that they stated they would and were able to wrap it up in a couple of days. This included: Replacement of a gutter that had come down due to snow Replacement of broken/missing slates Replacing a tin roof on our porch with shingles Moving the downspouts on our porch to improve gutter draining Replacing rotted wood on our porch and main roof Re-flashing our chimney. We found Absolute Home Solutions, Inc. prompt to respond and reasonable with great references. We had reservations conducting a long distance business transaction, however Steve emailed us before and after pictures along with being available anytime we called. We were pleased with the outcome. My husband and I couldn’t be more happy, everything looks great! 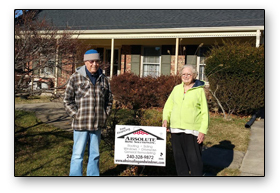 Steve did an excellent job of accessing the issues with our flat roof and siding and did the repair work indicated in a thorough and timely fashion. He actually did it himself, so that we won’t have to wait for one of his crews to complete another project. I wish I had found Absolute Home Solutions when I was identifying companies for roof and siding replacement. I would highly recommend this company and plan to use them in the future for replacement of our upper flat roof. It was wonderful. They were very upfront with any potential costs and did a very quality job. After beginning, they discovered that there were actually 3 layers of old roofing materials that needed to be removed. They also cleaned up very thoroughly and managed to do it without scratching my car which was in the driveway at the same time. They are a little pricey, but I would definitely recommend them and/or use them again because the service was wonderful (and worth the price). Steve Holmes was super. He called ahead when he was delayed in traffic, provided a thorough assessment and excellent workmanship. It was nice to meet someone who was upfront and didn’t try to sell more than he thought we actually needed, i.e. unnecessarily replacing sections of gutter that were in good working condition. Steve was responsive, affordable and professional. I would absolutely call on Absolute Home Solutions for future home services and repairs. Thank you! Hiring this company was our best decision. I had an independent roof expert (a service magic) contractor supervise the work. He told me that this was among the best crews he’s supervised. Mr. Holmes is not the least expensive but he doesn’t cut corners. He provides a 15 yr warranty, something I didn’t find among any of the other contractors (over 8) who provided quotes. We had structural damage that required a a county permit for insurance coverage to be valid. Out of all contractors Mr. Holmes was the only one willing to get the permit. The price was reasonable given the very high quality provided. Reliable. Honest. Trustworthy. Showed up on time. The price exactly matched the estimate. The project was completed in lightning speed, and the finished result was excellent! Without any reservations, I highly recommend Absolute Home Solutions!! Very professional estimator. He was the only one who really took the time to explain the different products and the pros and cons of each. This company was not the cheapest, but knowing that I’m going to be in my house for a while, I really wanted to go with the company that I felt most comfortable with. I am so glad that I did. The company is super responsive and communicated very well throughout the whole process. I love my siding. It looks amazing! My neighbors want new siding now. They did an excellent job of cleaning up. I would highly recommend this company. We had the house power washed and painted. New Simonton 5500 windows installed and a beautiful Pella entry door installed. We also had a 50 year warranty roof system installed with the proper ventilation and water proofing. 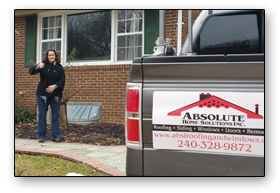 We have interviewed many contractors and we chose Absolute Home Solutions Inc. I must say they are not cheap, but let me tell you….Quality. Steve Holmes one of their consultants is extremely knowledgable about this business. With such high qualifications with several certifications and training of their work crews it shows. Steve even provided information that supported his findings that most other contractor were not able to explain properly or had the proper knowledge. I was shocked that from my previous interviews with other companies that were suppose to be certified, did not address many required components of my project. This could have, as Steve explained, effected my warranty. Thanks Steve!! The workers were very courteous, professional and the work site was organized. Clean up was amazing. It was cleaner when they left than when they arrived. Believe me when I say, with this company, you get what you pay for…..I most definitely will use them again for future services and have referred them to many of my co-workers and friends. I give this company a big A+. Steve and the team from Absolute Home Solutions did a tremendous job for us. We cannot thank them enough. The job was completed on time and on budget. We could not have asked for more. 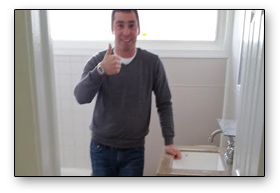 Steve met with us and advised us as to what we really needed in terms of our overall home improvement needs. Polite and professional. We could not have asked for more! Steve was the fifth contractor I interviewed. He was recommended by someone in the neighborhood. While not the cheapest, he was thorough, honest, and responsive, and cleaned up after himself. My neighbors never even noticed he was there. During the post-Christmas windstorm, part of the roof of one of my neighbors blew off. Steve came to check my roof free of charge and was able to diagnose my neighbors concerns. I have since recommended him to my neighbor. Repaired crown ridge of shingles that blew off in storm. Evaluated condition of other ridges. Steve got back to me literally within seconds of my entering my info. on this site, gave me an estimate the next day and made the repair within 48 hours–before the next rain storm. I am very appreciative. New Roofing, windows and interior work. Steve has done a lot of work for me for over the past 7 months. He is very reliable with the estimates and communicating with me. His crew is very quick to get on the job, fast working, very skilled and the work they produce looks great. “All the years I have had contractors here to solve my ventilation problems, you are the first to correct them properly, what a difference! Roof looks great and the technicians were very careful about my landscaping. Clean up was nothing less than perfect…Thanks! “I usually don’t make a decision the first time I meet with a contractor, but I felt so comfortable with you. You took the time to explain everything to me and did not try to sell me services I did not need. Thanks for the honesty. I will use you for my future window project! I will add you to our community services network. Thanks for your help!